Crisp apples are caramelized and then layered in between a buttery brown sugar crust and a strudel topping before being baked into these chewy sweet bars. 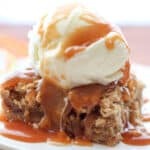 The first time I saw these Apple Pie Bars with Bourbon Caramel Sauce it was on my friend Tricia’s blog and I may have almost drooled onto my keyboard. 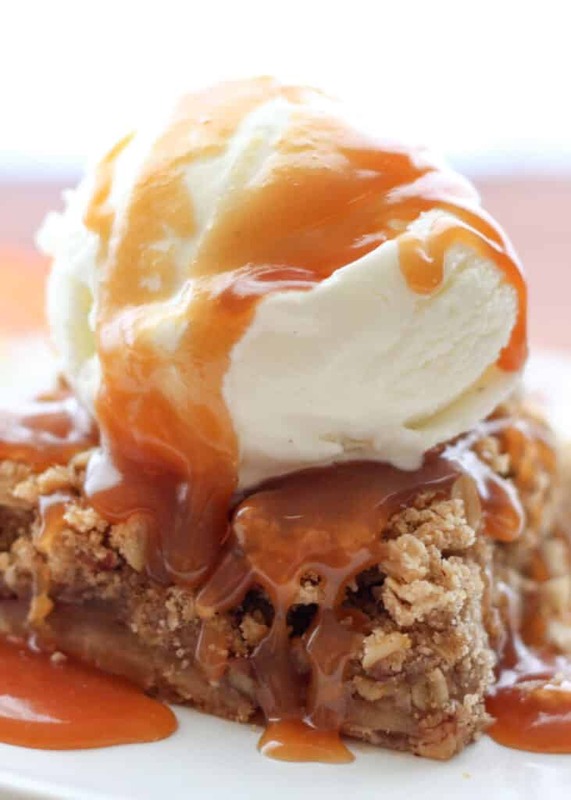 Serving these Apple Pie Bars topped with a scoop of Vanilla Ice Cream and a generous pour of Bourbon Caramel Sauce or Vanilla Bean Caramel Sauce makes this is a fall dessert recipe that simply can not be beat. I’ve made these apple pie bars twice in the past two weeks and they disappeared absurdly fast both times. I served the bars warm from the oven the first night I made them and at room temperature the following day. They were even better the following day. If you can make yourself wait, I recommend making them the day before or the morning of the day you plan to serve them. Preheat the oven to 350 degrees. Generously grease a 10" square or 11x7 baking pan with butter and set aside. Beat the butter and brown sugar together until light and fluffy. Slowly add the flour and beat again until a soft dough forms. Press the dough into the bottom of the prepared baking dish. Bake for 10 minutes, until the crust is set, but not browned. While the crust is baking, melt the butter in a large skillet over medium heat. Add the apples and sprinkle with the spices and the brown sugar. Cook until softened, about 5 minutes. Add the water and the bourbon and cook another 5 minutes until the apples and caramelized and the liquid is absorbed. Remove from the heat and set aside to cool for a few minutes. Combine all of the dry ingredients for the topping in a mixing bowl and stir a few times to combine. Add the butter and beat on low speed just until the mixture forms clumps. Spread the apples over the crust and then cover with the topping. Press down lightly to form an even layer. Bake for 35-40 minutes, until the topping is lightly browned. Cool completely before serving. 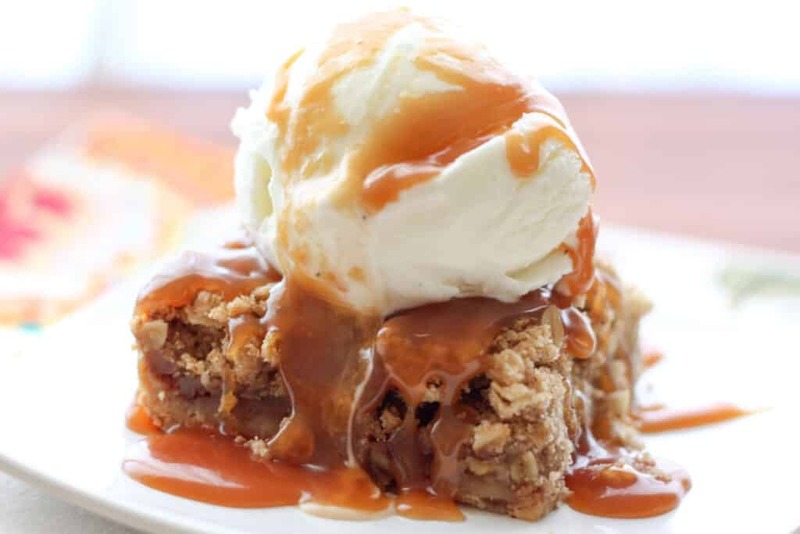 Slice the cooled bars and serve topped with Bourbon Caramel Sauce (or Vanilla Bean Caramel Sauce) and Vanilla Ice Cream. Enjoy! Your pictures are fantastic! This dessert looks perfect :) Have a great week Mary. This does look pretty awesome, especially with the caramel poured over the top. Thanks Mary! Wowsers!! This is totally my kind of desert!! Oh my - this is seriously DROOL WORTHY! It looks and sounds wonderful Mary. Would coconut flour be a good substitute? :) Hope you're doing well Mary - still loving your gorgeous photos. Don't you just love dessert! So yumjy! Big hit with the family. We just had them plain without the trimmings. Delicious!